McMurray Musings: A Cemetery in My Back Yard? Yes, Please. I heard it on the radio. The RMWB has plans for a new cemetery in the Wood Buffalo neighbourhood, and apparently there are concerns about location being expressed. 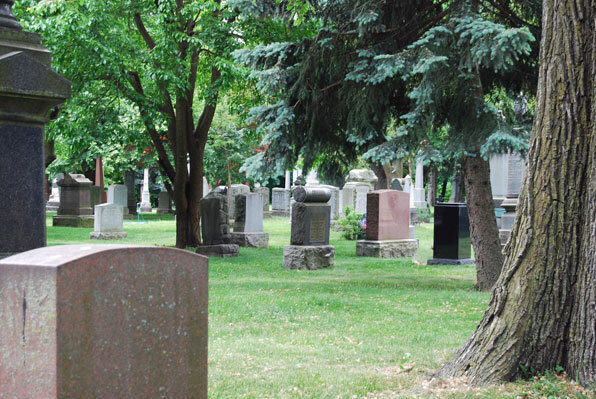 Some of the concerns involve the maintenance of current local cemeteries, but others seem more focused on the concept of having a cemetery in your neighbourhood. There is a certain “not in my backyard” thinking that can come into play, a “NIMBY” frame of mind. The funny thing is that when it comes to the idea of having a cemetery in my neighbourhood I have the opposite reaction. I tend to think “in my backyard, please”, because cemeteries are, in many ways, great neighbours. When I lived in downtown Toronto I walked to work every day. It was a lovely walk, from the neighbourhood around the Don Jail into Cabbagetown – and some of it meandered through a small city cemetery. 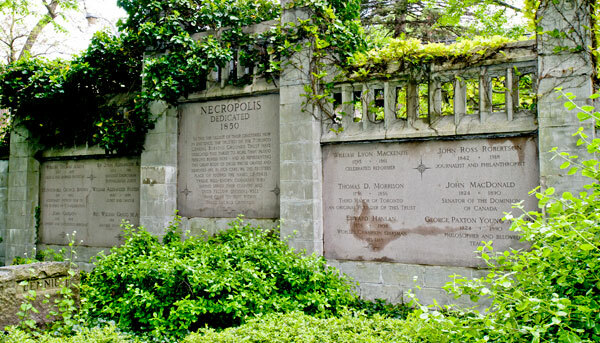 The Toronto Necropolis cemetery, established in 1850, is a lovely little green space in the middle of a very urban city. Every morning I would choose to walk through it, foregoing the surrounding city streets, because it was peaceful, and quiet, and serene. 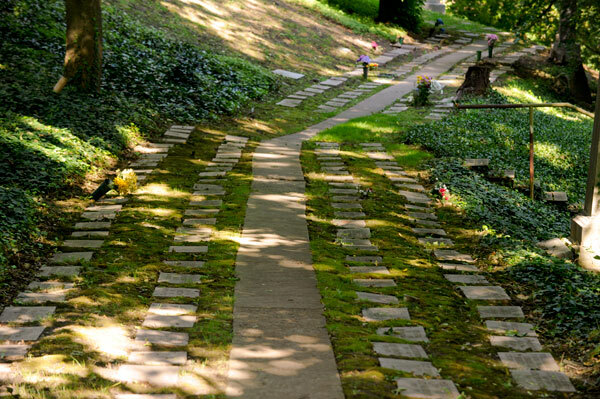 It might surprise some that on occasion, on busy days when I needed a respite from work, I would seek out the cemetery on my noon hours, choosing to park on a bench and eat my lunch and read a book. It was so beautiful there, and aside from the occasional visitors and the occasional funeral procession the quietest place in a very busy city. My parents are both buried in Saskatoon, in Woodlawn Cemetery, a place very centrally located. Again it is a beautiful green space, populated by jack rabbits that enjoy the vast expanse of park in which they can stretch those long legs. When I go back to the city where I grew up, and where my parents will now remain forever, I often visit that spot, and sit quietly with them. The neighbours in the area surrounding the cemetery seem untroubled by the cemetery, and I suspect they rather like it, because having a cemetery next to you is a bit like having a giant park in your neighbourhood, just without the crowds. My thoughts are this: cemeteries are very quiet neighbours. They don’t throw noisy late night parties, they attract only small groups of people, and generally only during the day. They are inherently peaceful, and while they are reminders of a part of life we rarely speak about – death – I think they are the gentlest of reminders. Unless you are afraid of a zombie uprising I cannot think of another reason to fear a cemetery in your neighbourhood, and instead can come up with a lot of reasons to welcome it instead. I suspect a lot of people suffer from coimetrophobia – the technical name for a fear of cemeteries. I also suspect much of that is because we in North America rarely talk about death, and yet it is something that defines our existence every single bit as much as birth. We may talk about afterlife in our churches and religions, but how many of us talk about death? Show of hands? I don’t see many hands, because it is a subject we avoid. We avoid it because it is painful, and uncertain, and because we are afraid to talk about something we often fear. I will admit that I have always liked cemeteries. In almost every city I have been to I have visited a cemetery. I have walked in cemeteries in Montreal and Vancouver, London and Dublin. I have stopped to read headstones, and I have sat and thought about life, and death, and listened to the silence, a silence broken only by bird song. I have eaten my lunch beside a grave, and I have sat on my father’s headstone while telling him all the things that have happened in the years since he has gone. I lived for some time in Abasand, close to the cemetery there, and the Intrepid Junior Blogger and I visited it many times, wandering through and reading headstones and looking at the mementoes left by those who love the ones who rest forever there. It seems the IJB has taken on my reverence and respect for cemeteries, as she too often expresses interest in visiting them when we see those gates that surround them. 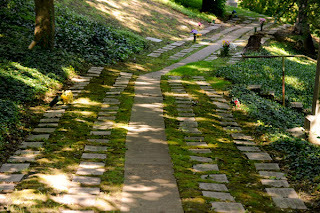 She and I will wander through, and talk about the headstones, and it gently leads into a conversation about death – and life. So, to those who may soon have a cemetery as a neighbour – I am, in fact, envious. I genuinely wish I had a cemetery close to me, close enough to wander into at will. I wish I had a neighbour that was so quiet, so peaceful, and so very much a part of our lives. I understand the concerns about maintenance, as that is a crucial issue to address – but if the concerns are about the cemetery itself, and the nature of having one as a neighbour – well, that is one concern I do not share and cannot understand. To me a cemetery is a place of peace, and quiet – a place to honour the lives of others, and a reminder to treasure every single day we have when we are above the ground, not in it. I went to the consultation meeting thinking not in my neighbourhood, and after reading the plans I was really convinced that this is a perfect addition to our neighbourhood. It looked like it would be set back in the trees and a beautiful location for our city. My grandma is buried at Woodlawn Cemetery in Saskatoon, and I agree it is a lovely spot in the city. Often rabbits are running through the park-like cemetery. I visit almost every time I go back to Saskatoon. Ah. People will NIMBY everything! 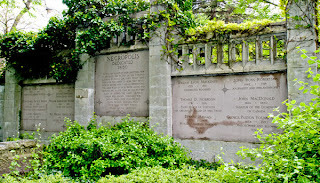 I loved Mount Pleasant Cemetery in Toronto. Peacocks. Just fun. And the stones are beautiful. Like this one. THe alternative is cremation. Then people scatter ashes in lakes, and swimmers end up swimming through them. sigh. I'm with you on cemeteries. They are beautiful and interesting places. Back in the day (before your day, and mine), they doubled as parks for the public and were well visited for picnics and not just for remembrance. As a child I had times of finding cemeteries spooky. But not anymore. Now I love the life stories suggested by the tombstones.